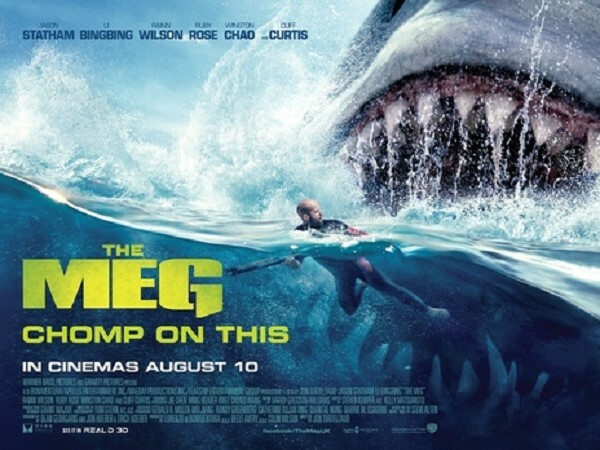 MyBayCity.com MOVIE REVIEW: "The Meg"
Saw "The Meg last night. Good movie. Great movie if you haven't already read the book by Steve Alten. It's about how a Carcharodon Megalodon, 60-70 feet long shark, breaks through a thermal layer over 6 miles down in the Pacific Ocean and causes an incredible amount of mayhem. Of course, there are a lot of action/rescue scenes. Not much gore, it is PG-13. The cast includes Jason Statham as Jonas Taylor, the rescuer, Bingbing Li is Suyin, a shark biologist, Rainn Wilson, a multimillionaire, Cliff Curtis is friend Mac and Winston Chao as the head of the project. There is a lot of action. Most of the time the movie takes itself seriously. However, there are times it doesn't and neither did I. In the scene from all the trailers where you see the Meg starting to go through a crowded swimming area. I laughed when I envisioned Meg going through the area with its mouth open and scooping up swimmers like a whale scoops up krill. I was the only one laughing. Oh well. It's well acted and filmed. Some critics complained that it wasn't "scientifically accurate. Oh for heaven's sake I thought, it's not a documentary. It's a good summer escape movie. So go. Have fun. Eat popcorn.